(Photo courtesy of Jenny Gardner). Few people watching the elderly man doing a street-performance of ‘Waltzing Matilda’ with marionettes made by the late Ann Davis, or playing the fiddle as a busker in East Ringwood, would have realised the intellectual breadth of this remarkable human being. Those of us who knew him valued his friendship, wisdom and humility. Harry Gardner was born in Perth and attended the University of Western Australia where he specialised in chemistry, and from where he eventually went as a Fulbright Scholar to Rensselaer Polytechnic Institute in upstate New York. On a blind date he met a Cornell chemistry graduate, Lorrie Niedeck. It was a happy match and after they married the couple moved to Melbourne where Harry had landed a job with the CSIRO. Lorrie had become a Quaker, and that is how she met a fellow Quaker visiting Melbourne, Dora Beacham, who came from London in 1966-7 and did some teaching in an Aboriginal community in South Australia. In London Dora was a member of the Educational Puppetry Association and later became a much valued supporter of the Puppet Centre. She introduced Lorrie to puppetry and put her in contact with Edith Murray whom Dora had met in London in 1963. It was Harry who built Lorrie her first puppet theatre and encouraged her to go into business. ‘The Gardner Puppet Theatre’ became a regular visitor to schools in Victoria for 40 years; it was also a training ground for some talented puppeteers, such as Frank Italiano, Ian Cuming and Ralph Baker. Lorrie was President of UNIMA-Australia for three years and in that role did considerable groundwork in preparation for the 2008 UNIMA Congress in Perth. She retired in 2004 because of ill health and a grateful UNIMA-Australia awarded her a Life Time Achievement Award. When she died in 2005 Harry carried out her wish to endow a puppetry scholarship for UNIMA which bears her name. I got to know the Gardners when I began touring schools in Victoria in 1969 and was often invited to their happy home in East Ringwood. Harry worked at the CSIRO in Port Melbourne, quite the opposite side of Melbourne from where they lived, a three-hour daily commute. I have a memory of visiting him at his work once where steaming retorts on his bench were part of his research into aluminium. In retirement he visited local primary schools with experiments designed to encourage an interest in science. Harry was a keen collector of Australian folksongs which he played on his fiddle. 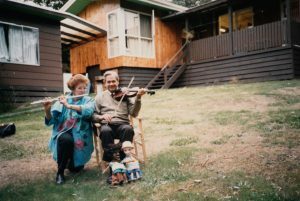 Sometimes Lorrie would accompany him on the flute and their son Henry, now a reader in computer science at ANU, continues the violin tradition. Once when Harry and Lorrie were visiting the Southern Highlands some of us puppeteers were having a meal with them in a Thai restaurant and people at the next table started singing ‘Happy Birthday.’ Harry instantly produced his violin and provided an accompaniment. In later life Harry, who was a member of the Humanist Society of Victoria, became a strong supporter of the teaching of ethics in schools and devised courses for classes. One of his ethics lessons was based on ‘Waltzing Matilda’ and on at least one occasion he used his puppets to illustrate it. A rational thinker, he was also a strong supporter of assisted dying and urged Victorian MPs to pass legislation to allow it, personally visiting some 50 parliamentarians in and around Melbourne. Happily he himself died peacefully and naturally in hospital, surrounded by his children. 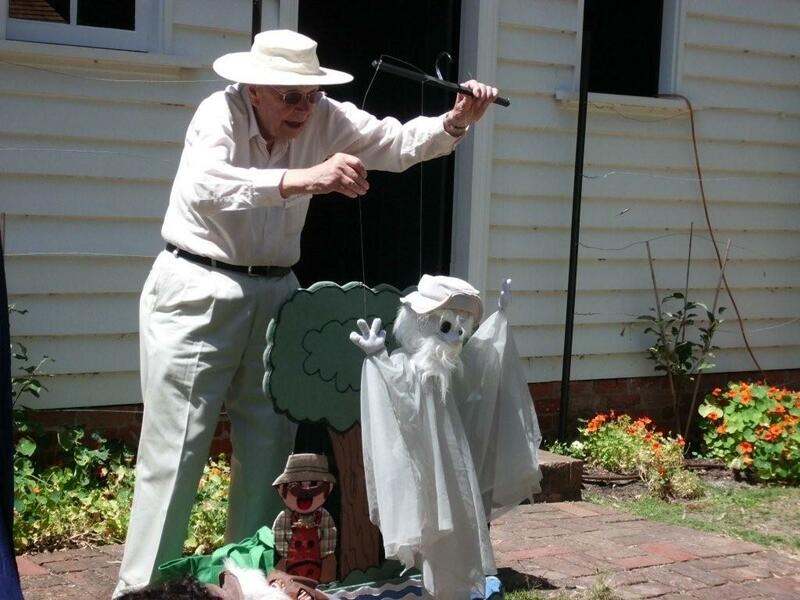 Those in the puppetry community who knew Harry have lost a great friend. Our sympathy goes out to Henry, Gayle and Jenny on their loss of a wonderful and impressive father. Although Lorrie was the professional puppeteer, Harry’s ‘Waltzing Matilda’ puppet show was popular at events such as folk festivals. He last performed it in mid-January to a group of elderly citizens. Click here to find out more about Harry’s musical legacy. This entry was posted in News, Uncategorised on Thu 15 Mar 2018 by Oz. 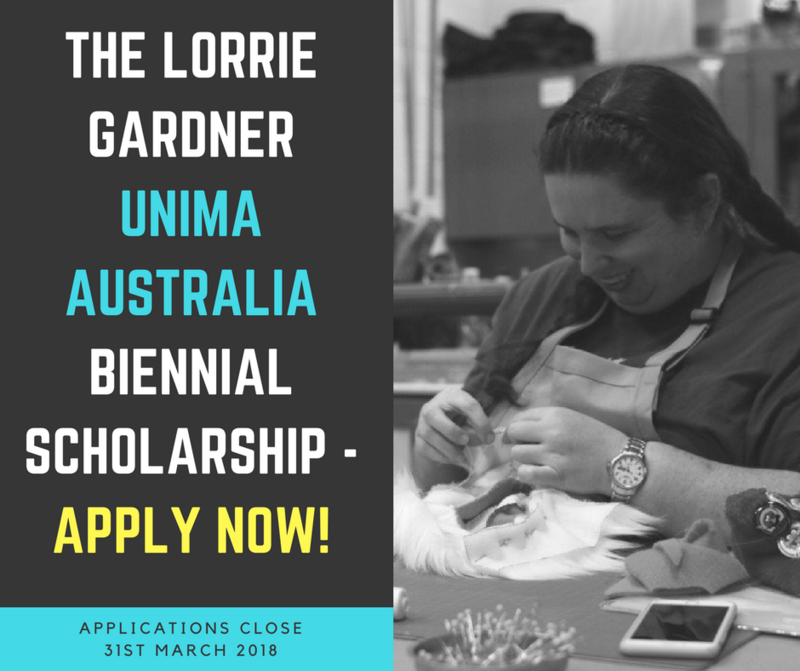 Applications are now open for the 2018 Lorrie Gardner UNIMA Australia Biennial Scholarship! Projects must start no earlier than May 1st 2018. Successful applicants will be notified by Saturday 21st April, 2018. She will forward them to the current scholarship committee: Joanne Foley, Philip Millar and Sue Wallace. Lorrie Gardner of Gardner’s Puppet Theatre was a longstanding and active member of UNIMA Australia. She was President for 3 years until illness forced her to retire in 2004. In 2005 Lorrie Gardner bequeathed a substantial contribution to the fund and the renaming of the scholarship fund is to honour not only her financial contribution but her artistic contribution as an outstanding puppetry practitioner, teacher and colleague. The Scholarship Fund has been created through the individual contributions of members. The purpose of the scholarship is to assist the development, evolution and growth of Australian puppetry arts & culture by benefiting UNIMA Australia Inc. members. 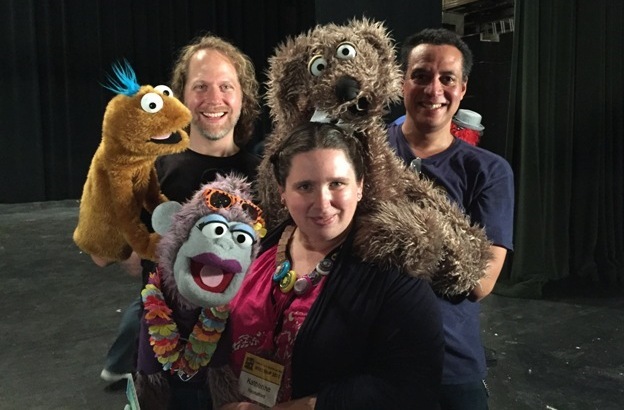 All activities, projects and situations must be puppetry oriented. The Scholarship is offered to individual puppetry practitioners to further develop their puppetry practice. Error: Error validating access token: Session has expired on Tuesday, 26-Mar-19 01:31:00 PDT. The current time is Tuesday, 23-Apr-19 05:50:09 PDT.